IBM BigFix operators often find that it is useful to extract the wealth of data on the IEM Server for analysis and reporting. They either process the data themselves, or will often send the information to other consumers in an Excel format. (3/30/2011) For computer properties, changed generated relevance from (if exists result) to (if exists values of results) because some results are NULL. (3/30/2011) Fixed concatenation character %0A not working in Web Reports version 8.1. This is due to Web Reports escaping control characters. (3/30/2011) Fixed Analysis properties for BES Computers not being restored. (7/26/2010) Cleared worksheet formatting when returning results from Session Relevance Editor. (7/26/2010) Refreshed content cache when switching Web Reports. (7/26/2010) Fixed bug found by Nick Holmes on Forum http://forum.bigfix.com/viewtopic.php?id=5394. The filter does not work against properties with multiple results. (7/24/2010) Supported HTTPS connection with private certificates. (7/24/2010) Fixed problem with Web Reports URL with trailing forward slash (e.g. http://server:80/). (7/18/2009) comboBoxProperty for filter name not concatenating property if it is a property of an object. (7/18/2009) When Checking a parent node of a list of property names, and if there are children already checked, they get duplicated in the selected list. (7/21/2009) Tab order for fields (3 of them) used to create a filter corrected. (7/24/2009) Missing Analysis properties if multiple activations. Helped fixed by Stephane Minisini of eSpeed. (7/20/2009) Added auto-complete functionality to the comboBoxProperty - to select Properties for filtering. (7/21/2009) Combined 2 BES Site queries into one to improve caching speed. (7/21/2009) Added Remediated attribute to BES Fixlets. Also possible to search on Remediated. (7/21/2009) Made the “Value” column in the filter data grid editable. This makes it easier to change a query criteria. This will be extremely useful for my customers! I can’t wait until we migrate to BigFix 7.2! Question: Why can’t it work on previous versions? I’ve taken a look at the EvaluateRelevance() JS function (web reports v7.1.x), and it simply opens a request to the webreports page, and I bet the plug in is doing the same thing, because it requires the web reports URL, username, and password. Am I wrong? You are correct that the Connector is using the SOAP API to access Web Reports. We modified the SOAP XML namespace in version 7.2. Some language bindings are very forgiving (Perl for example), but the .NET Framework used for the Excel Connector insist on strong type checking. Is there any way I can use this with bigfix version 7.0 I can’t wait for upgrading to version 7.2? Yeah, sorry that this won’t work for you right now. As Jerroyd had guess correctly, source code is difficult because of a few reasons. One being some externally licensed components. Thanks for reporting this. I believe this is fixed in the latest version. I sneaked in a v1.1 release 7/20/09. If you don’t have a Wizard saying this is v1.1, then you have the older version. The most useful enhancement is the addition of the “Remediated” attribute for the BES Fixlet object. This is not a normal attribute, but a computed field. I will work on including a few common computer properties in the next version. These will be OS, IP address and last report time. I’ve installed the tool, but I’m not sure how to invoke it. What am I missing? View | Toolbars | BigFix Connecter. Very nice work guys. I’ve been buried alive with other projects and haven’t been keeping up with the latest cool stuff. Can you add BES Custom Sites to the Inspector objects. We are starting to use custom sites in a big way and it really would be nice to have it available. Also do you have plans to include come of the other inspector types that are listed in the Session Inspector guide? I would also like to be able to save queries and open saved queries directly from the Query Wizard. Some very good ideas there and reasonable requests. Especially the saving of queries and others have asked for similar functionality. What properties do you need from BES Custom Sites? 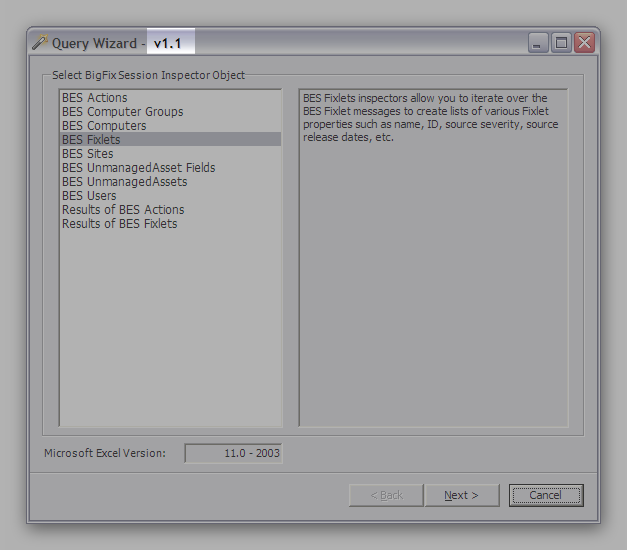 It is possible to issue Relevance statements to retrieve the results using the Session Relevance Editor. What other objects (inspector types) have you come across that you believe might be useful? If you save the spreadsheet, the Wizard will remember all your options. There is currently a hidden worksheet created name “BigFixExcelConnector” that contains various info about the query. Do you think any of the following are/could be possible? Run a relevance as a excel macro? Include data from excel in a session relevance execution… Ie. Have worksheet with a list of fixlet ID’s and run a macro that picks up each of those ID’s and then runs a session relevance command against each one of them publishing the data into seperate tabs and then performing further work on them within the macro. 2). Save session relevance command within the spreadsheet (so we can have complex statements within a sheet we can just open and hit a button to refresh the data). I guess we could run it in the session relevance tester but that appears (not tested yet as it’s just on our dev platform) to be limited to 1000 rows? (some of our queries will return 30,000 to 100,000 rows). With programming, it is possible, but nothing trivial or available out-of-the-box. With Excel macros, we have access to Visual Basic. All the work that I do with the BigFix Connector uses the SOAP API. With the Session Relevance Tester, the 1,000 limit is just a random number I picked as not to overwhelm the client. You can change that right up on the button tool bar where it says “Max Rows”. The version out there has a hardcoded limit where the SOAP call will timeout after 100 seconds. So if your statement takes a while, it will abort after 100 seconds. I can recompile a version without the limit if needed. The excel plug in is a great tool. When we run the field on a specific field that has a large amount of data we get a message back that states cells over 900 chars have been truncated.